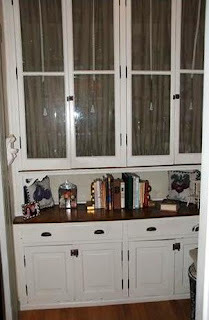 This is a mini post to tie up a loose end I left hanging way, way back when the pantry was being redone to accomodate the doorway to the new powder room. The left side was reconstructed with glass shelves for glassware and dishes. The idea was to have two framed glass doors made to fit side by side. However, after much research it was determined that no one wanted to make 86" high doors that were only about 15" wide. So Plan B was put on the table. Long story short Plan B (to make frameless glass doors similar to frameless shower doors) also bit the dust. 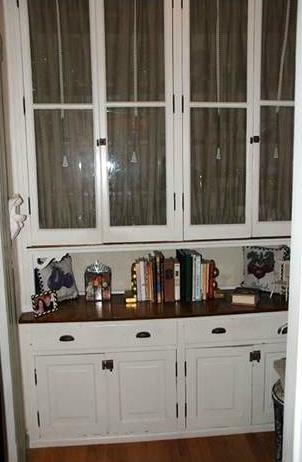 Not only would they be extremely expensive but the hinges were not what I wanted in this space. Was I disappointed not to have my tall glass doors on this opening? A little, however, I lived with it so long during the research that I got used to it without doors. It seems to be working fine this way. Even when I lie on my back on the floor, I cannot squeeze the very top into the shot. Back to what's happening in the foyer in my next post.